President Iohannis announced on Tuesday that the Supreme Council for National Defence (CSAT) gave its green light on the state national defence budgets, yet warning that budget draft overall is “questionable”, “too optimistic”, and “overrated”. Members of the CSAT gathered at Cotroceni Palace on Tuesday for debates on the size of the budgets for the national security institutions, namely the intelligence services. “The Government prepared a draft budget that it wants to send in Parliament. The draft seems questionable to me. This budget stipulates an extremely high rise of the expenses and, in experts’ opinion and in my opinion, this budget is too optimistic, overrated. We talk of a 15% rise, there is no pertinent explanation for this huge rise. Even if we consider that Romania’s economy grows, which we all want, such a high increase is hard to accomplish. It’s even harder to understand why the budgets for national security institutions have decreased,” President Iohannis said at the end of CSAT. According to the drafts, the budgets of the intelligence services (Romanian Intelligence Service, Foreign Intelligence Service, Special Telecommunication Service and Protection and Guard Service) decreased by about ten percent, while the Interior Ministry is approximately the same as the one last year. The Romanian President pointed out that the 2 pc budget allotted to the Ministry of Defence is in compliance with the commitments in force, arguing that “the money should be used for long-term endowment programmes”. In the end, CSAT gave its consent on the national security budgets. “Important to know is that the government through the prime minister and the minister of Finances have committed to complete these sums where there might be problems through the budgetary rectification, particularly on the staff salaries,” the president added. The CSAT meeting led by President Klaus Iohannis on Tuesday was the first attended by PM Grindeanu and the members of his cabinet. 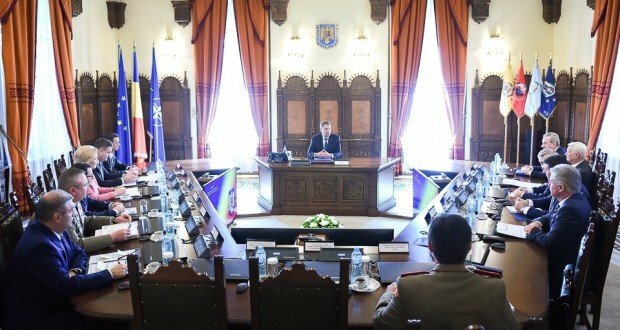 President Klaus Iohannis has summoned the Supreme Defence Council (CSAT) last week after he has warned that the sums allotted to the national security services are too low. Subsequently, after several hours on hold, the Government announced that it postponed to approve the budget on Tuesday, after the CSAT meeting.